It seems like May was a ripe month for art pranks all across the world. In addition to the modern art prank that took place at SFMOMA in the United States, there were two rather high-profile pranks that took place at art galleries in London. 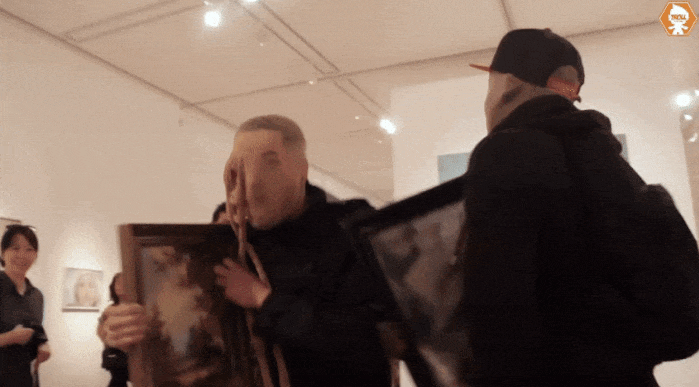 In the National Portrait Gallery, members of a Youtube video group named "Trollstation" donned cheap masks, carried cheaply framed paintings and ran through the gallery pretending that they had stolen the paintings off the wall. 'Trolling' is an internet term for actively harassing other people, usually in a tongue-in-cheek way, although it can rapidly become more malicious. Though the paintings were demonstrably cheap, the group was intending to cause as much chaos as possible. One woman fainted during the chaos, and the group took off before the police arrived to take the situation in hand. They weren't off to congratulate themselves and lay low, however. Instead, they took off to the Tate Britain gallery where they repeated the stunt. This one was slightly more elaborate, and by the end of it, they had dragged off a woman in a headlock, although it later turned out that she was in on the entire prank and was not an innocent bystander. The video of the National Portrait Gallery "heist" is still visible on the Youtube channel of the pranksters, although the Tate Britain video has yet to appear. Unfortunately for those involved, the authorities naturally took a rather dim view of the whole affair, and all four members of Trollstation were sentenced to short periods of time in jail, ranging from 16 to 20 weeks. It's understandable that in the currently hyper-vigilant climate that exists throughout the West, joke crimes are going to be taken far more seriously than they might otherwise, but it's important to remember that nobody was actually hurt in any of these events. Please don't take this as a defense of their foolishness, but just a reminder that knee-jerk reactions to performance art can be a slippery slope to start down.